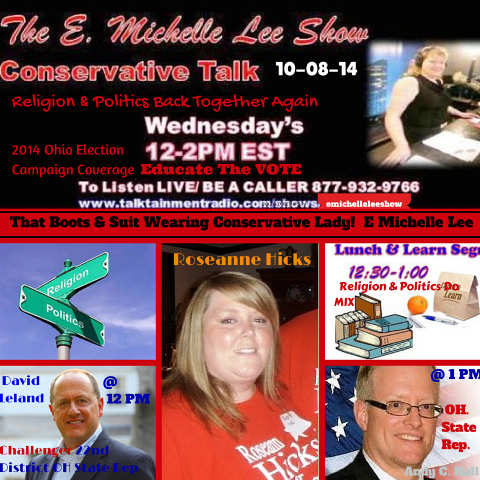 This entry was posted in Christian Voting, Conservative Talkshow, Ohio, Ohio Events, Radio LIVE, Radio Show Host, Women of Faith and tagged #Ohio2014ElectionCampaignCoverage, Andrew C. Hall (R), Conservative Radio Programming, David Leland LIVE on #EMichelleLeeShow 10-8-14, E Michelle Lee, E Michelle Lee on Talktainmentradio.com, E. Michelle’s “Are You Serious” moment of the week is?, Help Educate The Vote, Michelle Lee, Ohio Election Campaign Coverage, Ohio State Rep. 22nd District LIVE in studio with radio talk show host #EMichelleLee, Radio Show Host, Religion & Politics for America’s Freedom, Religion /Politics- why don’t they mix? Why they should! on #EMichelleLeeShow WED. 12-2PM EST 10-8-14, Religion and Politics, Religion and Politics when where and how they split, Roseanne Hicks, Roseanne Hicks LIVE on #EMichelleLeeShow, TODAY: Wednesday 12-2PM EST. Bookmark the permalink.